Thus begins the spiral where every day is the worst day of Ganta’s life. I think like there is a trend toward games being do-able in 5 hours, there is a similar trend toward anime being shorter. Macross was 36 episodes long, many of the classics from the 90s like Cowboy Bebop ran for 26, but more recent shows like Baccano! were only 13 episodes long. While Baccano! actually did everything it was supposed to in 13 episodes, Deadman Wonderland shows itself to be more problematic. Deadman Wonderland (デッドマンワンダーランド Deddoman Wandārando) follows middle school student Igarashi Ganta as he winds up on death row for a crime he didn’t commit, namely slaughtering everyone in his class. He arrives at Deadman Wonderland, a prison that doubles as an amusement park where the death row inmates themselves serve as entertainment to the general public. Soon, he discovers that he is a Deadman, or one who can use his own blood for superhuman powers. While Ganta sets about looking for ways to clear his own name while bringing those responsible to justice, he discovers there are powers interested in his abilities. I was in awe of the sound and visuals when I first started watching Deadman Wonderland. Deadman Wonderland featured great voice acting, namely Romi Park, known for having voiced Edward Elric in Fullmetal Alchemist, as Ganta. Overall, the music stood out in a good way, especially the opening and end themes. As far as the animation, movements are fluid, and the colors used are bright and bold. Furthermore, the characters had very unique character designs, giving everyone the personality they needed. 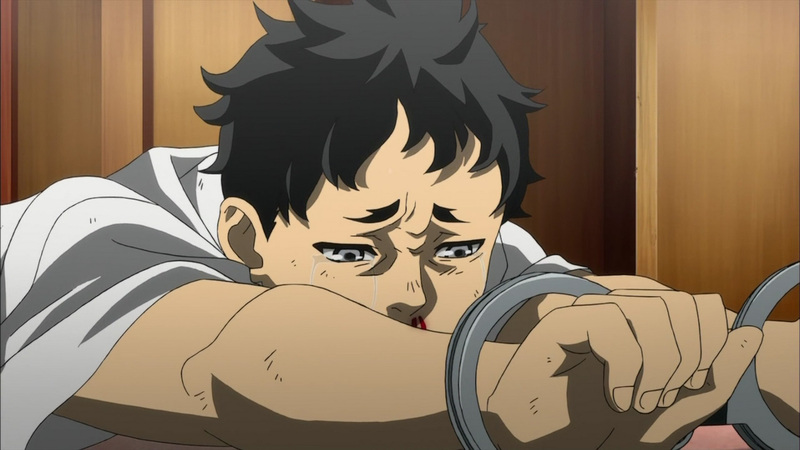 I need to say Deadman Wonderland also had some of the most well-animated blood I have ever seen. And speaking of blood, Deadman Wonderland is also the single goriest anime I have ever seen. A major plot point of the movie is the gladiator fights between Deadmans. Expect to see people getting mutilated in ways that makes Rurouni Kenshin: Tsuioku-hen look like Pokemon by comparison. Let’s not even go into how the prison also conducts experiments on living prisoners. With that in mind, you should know Deadman Wonderland is, first and foremost, a horror anime with some action and some comedy here and there. It chronicles Ganta as he gathers the strength he needs to get his name cleared while he meets allies (and enemies) along the way. The prison atmosphere created appropriately is created so there really is no reason for Ganta to have any hope to get back to leading a normal life. Where Deadman Wonderland succeeded in creating the world around Ganta, it utterly failed with Ganta himself and with Shiro, the albino girl with superhuman abilities who serves as the show’s other lead. As the show progresses, more and more hints of the two’s pasts get revealed. However, I felt like I generally knew the side characters, like Deadman fighter Minatsuki, much better than I knew Ganta or Shiro. However little I knew about Ganta or Shiro, I knew even less about the show’s antagonists like Promoter Tamaki, and that brings me to my chief complaint with Deadman Wonderland. The anime adapted the first 21 chapters of the manga. Studio Manglobe was intending to follow up with a second season, which would cover the rest of the manga. Unfortunately, we may never see that happen as the Deadman Wonderland anime absolutely bombed in Japan. Thus, we will be left with the ending the anime has as of now, which resolves next to nothing of the show’s plot. Had the show actually resolved the plot, I would have had an easier time forgiving the pacing. The writing in the first half of the series paced development at a rate that would have been fine had Deadman Wonderland been a longer series. After that, the writers seemed to have decided that they were going to have to race against the clock to see how much of the manga they could adapt. All in all, the show’s writing turned out to be a complete mess. I have not been this disappointed with an anime series in a long time, especially when it started out so well. It was one time I really should have read reviews before making that my pick for the FUNimation sale Rightstuf was holding. The show had great production values, but seriously faltered in areas that mattered, namely in the story. Deadman Wonderland is very much a title where you would be better off reading the manga.